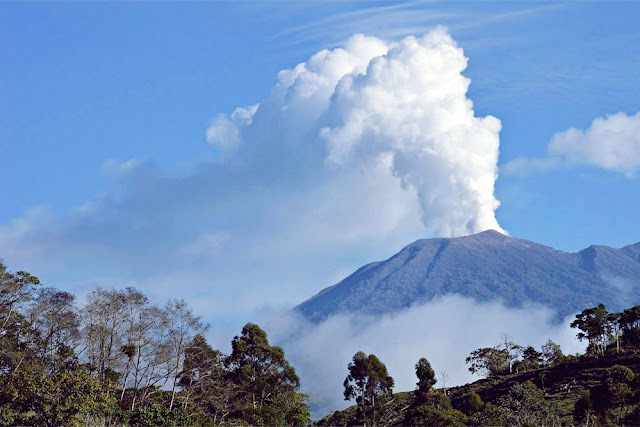 On Monday, January 15 at 4:11 a.m. the cameras of the National Seismology Network (RSN) recorded the moment of an eruption at the Turrialba Volcano that lasted for 14 minutes. "Although the visibility was scarce, the surveillance camera of the National Seismology Network located closest to the active crater was able to partially capture the process. It wasn't possible to estimate the height of the eruptive column", states the information posted by Dr. Mauricio Mora from the RSN. The latest report from the National University's Volcanology and Seismology Research Institute (OVSICORI) states that in the past 24 hours the activity in the Turrialba Volcano has been low except in the early hours of this Tuesday when seismic activity was registered between 4 and 4:30 a.m., which coincides with the emanations of ash that were dispersed to the southwest of the volcano. The Rincon de la Vieja Volcano in Guanacaste also registered some low seismic activity as well as the Tenorio Volcano, area that has recently been affected by an earthquake swarm which caused last week the change of coloration of the Rio Celeste River, however, OVSICORI confirms the latest activity hasn't affected the river color again. Last week the Tenorio volcano in Costa Rica was put on alert when a seismic swarm was recorded after the 7.8 magnitude earthquake in Honduras on Monday. The seismic swarm recorded the day after the massive quake hit on the eastern flank of the Tenorio volcano.